A coalition led by former Alshabaab deputy leader Mukhtar Robow has stated that the December 19th new date set by the southwest election commission may make it impossible to have a free fair and faor election since most of the international community will not be present during the Christmas festive. The statement dated 2 December and signed by regional presidential Robow, Ibrahim Maalim and Nur Adan Nur partly stated "The newly set election date is at a time when the international society is preparing for the festive season and so makes it hard for proper supervision from int. Agencies. And so that creates fear of whether the polls will be free and fair". "We are asking the UN, EU, AU, IGAAD and Aid agencies from USA, UK,FRANCE, SWEDEN, NORWAY, DENMARK, Finland, Italy,Germany and others who care for the wellbeing of somalia to stand by us so that we have a free and fair elections in southwest somalia" the statement added. "The aspirants are urging the security agencies to act steadfast and prevent any issue that deters peace effectively"
The electoral commission of Somalia's Southwest state has admitted it is ill prepared for the elections set for December 5 forcing to push the date to 19. A statement released by the commission said it had huge task remaining to be completed before the elections. It noted the lacked election materials and its staff had not receive the necessary training. The race pits former Al-Shabaab deputy leader against pro federal government candidates. 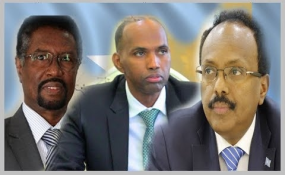 Government backed former spy Chief Hussein Osman Hussein, former Trade Minister Abdiaziz Hassan Laftagareen and former Somali envoy to Uganda Siid Ahmed Muse will be challenging Robow in the race.